INTRODUCTION TOTHE FIRST AND SECOND CANTOS OFCHILDE HAROLD. The First Canto of Childe Harold was begun at Janina, in Albania, October 31, 1809, and the Second Canto was finished at Smyrna, March 28, 1810. 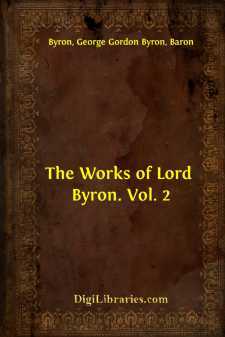 The dates were duly recorded on the MS.; but in none of the letters which Byron wrote to his mother and his friends from the East does he mention or allude to the composition or existence of such a work. In one letter, however, to his mother (January 14, 1811, Letters, 1898, i. 308), he informs her that he has MSS. in his possession which may serve to prolong his memory, if his heirs and executors "think proper to publish them;" but for himself, he has "done with authorship." Three months later the achievement of Hints from Horace and The Curse of Minerva persuaded him to give "authorship" another trial; and, in a letter written on board the Volage frigate (June 28, Letters, 1898, i. 313), he announces to his literary Mentor, R. C. Dallas, who had superintended the publication of English Bards, and Scotch Reviewers, that he has "an imitation of the Ars Poetica of Horace ready for Cawthorne." Byron landed in England on July 2, and on the 15th Dallas "had the pleasure of shaking hands with him at Reddish's Hotel, St. James's Street" (Recollections of the Life of Lord Byron, 1824, p. 103). There was a crowd of visitors, says Dallas, and no time for conversation; but the Imitation was placed in his hands. He took it home, read it, and was disappointed. Disparagement was out of the question; but the next morning at breakfast Dallas ventured to express some surprise that he had written nothing else. An admission or confession followed that "he had occasionally written short poems, besides a great many stanzas in Spenser's measure, relative to the countries he had visited." "They are not," he added, "worth troubling you with, but you shall have them all with you if you like." "So," says Dallas, "came I by Childe Harold. He took it from a small trunk, with a number of verses."